Second consecutive day of protests: Thousands of Egyptians defy gov't ban on protests, angrily calling on President Mubarak to resign. Six dead. Second day in a row: Thousands of Egyptians defied a government ban on protests today and angrily called on President Hosni Mubarak to resign. The U.S.seems to have partially abandoned its long-time Arab ally, with Secretary of State Hilary Clinton telling the Mubarak government it must implement democratic reforms and allow peaceful protests. Six people are reported dead and hundreds have been arrested following the second day of protests in several Egyptian cities. In the city of Suez, rioting demonstrators set fire to a government building on Thursday. The ailing Mubarak, 82, has been in power since 1981, after the assassination of his predecessor Anwar Sadat. He has not said whether he will run in the September elections; he has long been considering backing his son Jamal. A leading figure in the pro-reforms movement is Mohamed ElBaradei, who is set to return to Egypt as the anti-government protests give his bid for the presidency a powerful boost. 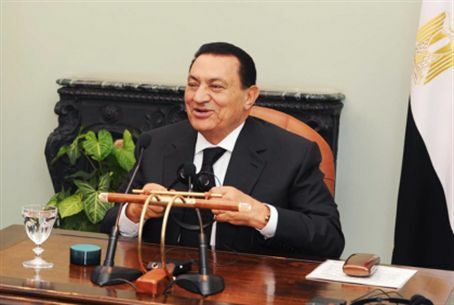 The White House pointedly turned down a direct opportunity to affirm support for Mubarak. Asked if the Obama administration still backed Mubarak, White House spokesman Robert Gibbs said only, "Egypt is a strong ally." "I do think it's possible for there to be reforms,” Clinton said at a State Department press conference with visiting Jordanian Foreign Minister Nasser Judeh, “and that is what we are urging and calling for." The U.S.position is somewhat surprising, seeing as if Mubarak’s regime falls, it is likely that the extremist anti-Israel and anti-West Islamic Brotherhood will gain much power.